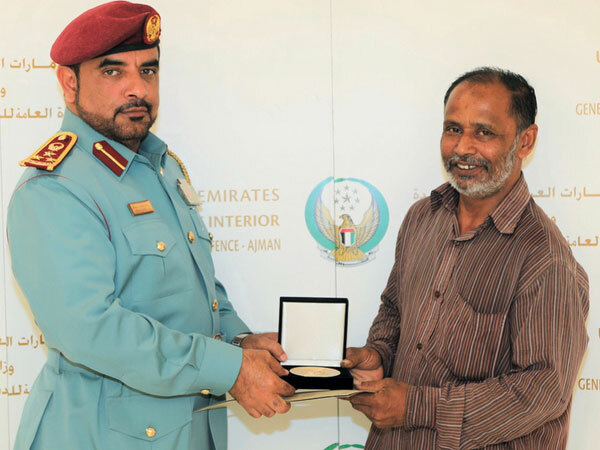 Dubai: A 50-year-old man in Ajman was recognised by local authorities for his exemplary behaviour and heroism when he rose to the challenge and saved the life of a young boy. Bangladeshi citizen Farouk Islam Nour Al Haq was awarded on Tuesday by Ajman Civil Defence for his role in rescuing a three-year-old boy, who was thrown off the balcony of a burning apartment on the second floor. The incident happened last Monday, when a residential building in the Al Nuaimiya 2 area of Ajman caught fire. While the child escaped unscathed, the Asian mother who jumped after her son suffered multiple injuries. Another Arab man was also injured after jumping from the first floor of the burning building, while a family of seven also had to be rescued by firefighters. The fire, which started near a freezer and a washing machine kept in the corridor of the building, caused thick, black smoke throughout two floors of the building. On the day of the accident, Al Haq said he was on his way to a grocery store when he saw a building on fire. A Pakistani woman on the second floor started to scream in Urdu for help, and as he was the only one in the area who understood the language, Al Haq immediately responded and came to her aid. Is the yoga you are learning the real thing?